Like you would have come up with something better than "So have you ever played ice hockey?" Imagine speed-dating someone over video chat who doesn’t speak your language. A chaperone takes notes—not of your character, but on whether you spoke ill of the chat technology itself: Skype Translator. This was my life on Monday, and I spent 20 minutes of painful awkwardness to teach you this lesson: When you use Skype Translator, speak, don’t talk. To mark the eighth language added to Skype Translator—Arabic, spoken by 200 million people—I was invited to speak to Dalia*, a Microsoft contractor of Egyptian descent who was currently working in Michigan. Dalia, bless her, was paid to have reporters ask her dozens of inane questions to test out how Skype Translator works. 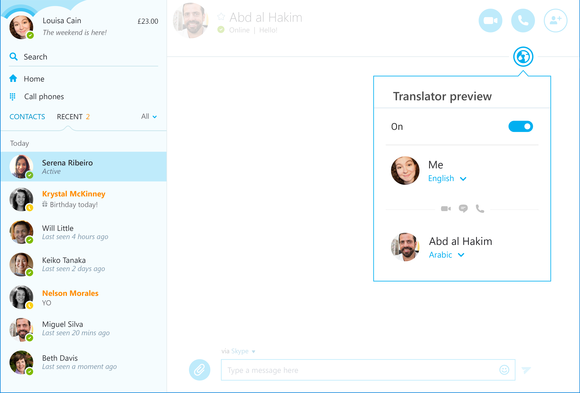 You can try out Skype Translator for yourself: It went live to all Windows desktop users in January. 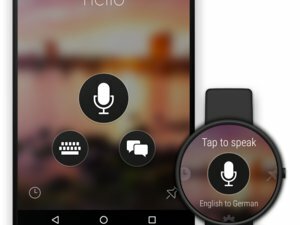 The technology has been compared to the universal translator of Star Trek fame: Just click the globe icon in the Skype for Windows desktop application, then pick your language. You then speak, and your words are translated in subtitles and orally to the person at the other end of the Skype call. He or she responds, and you hear what he or she says. This already works in English, Spanish, French, German, Mandarin Chinese, Italian, and Portuguese. 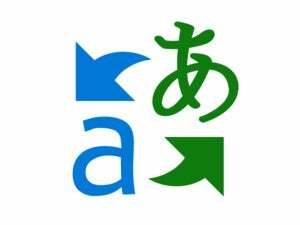 To access Skype Translator, click the globe icon within Skype for Windows. I should say that as a professional reporter, I have been in situations where people do not want to talk to me. This does not faze me. I do not, however, believe that Dalia considers me functionally literate. Pause. Pause. 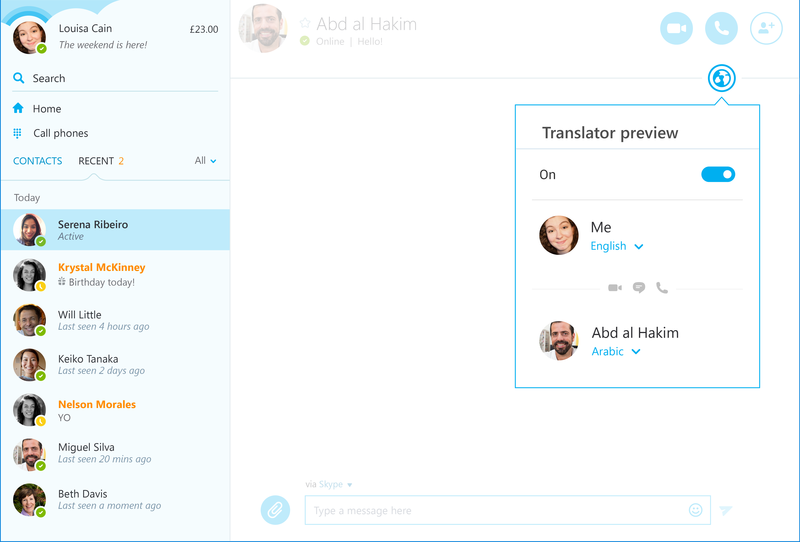 Skype Translator has to parse all this, remember, then repeat what I said in Arabic. Pause. Smile. Smile. We have to keep staring at one another while we do this. Then from Dalia: “Okay,” along with what I can only imagine was severe doubt that I’d ever participated in any sort of social situation before in my entire life. It went on from there: How cold was it in Michigan? Have you participated in winter sports? Have you played hockey? (Yes, Mark, she probably ice-fishes too, you bloody idiot.) I recall browbeating the poor woman into telling me how hot it was in Egypt (“I need a number, just to test the translation”) as well as inquiring how busy the streets were. I did this for you, people. What I can tell you is that as magical as Skype Translator is, you’ll still need to treat it, as, well, a traditional translator—one that listens to what you have to say, figures out what the words actually were, and relays that translation to the other party. You can’t really talk—with the ah’s, um’s, and crosstalk that usually accompanies a traditional conversation. Or you can, I suppose, but when Skype begins translating what you’ve said for the other party, you tend to politely shut up after a few words. And then Skype thinks that you’re actually saying something else, and then you can see that translation take place in real time, and then you say something else to clarify things, and then you finally just clamp your lips together because this poor woman clearly is not being paid enough to sit through your blather. Basically, Skype Translator works best when you pretend you’re Barack Obama delivering the State of the Union address, rather than trying to explain to a highway patrol officer why you're carrying a priest, a sheep, a length of rubber hose, and a canister of ether in the back of your vehicle. Speak clearly and distinctly, in other words. *Editor’s Note: Given the technical difficulties above, I’m not sure if I spelled Dalia’s name correctly. If I didn’t, let’s consider it an alias so this doesn’t haunt her for the rest of her professional career.